In this box everything you need to make a Grande escape. First, let’s create the scenery. Flowers, a fragrant candle, comfortable shoes to lounge in, and a hot refreshing shower. Normally yeah, my shower routine is rushed. With 5 rambunctious children, it’s very hard to relax. So taking a two week challenge in which I had to relax was a challenge indeed. But I pulled though, and Nivea Touch of Frangipani helped me make it though. 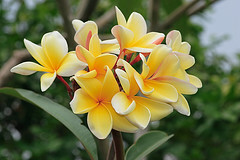 Some of you may know, but a few of you may not, Frangipani is Plumeria, a flower native to Hawaii. Now I tried to find some of those flowers to create a great escape, but there were none on 1800Flowers.com. So I had to go another route and find a flower that was fragrant and that I love just as much as the Plumeria. Gardenias. I love those. So I have my flowers, I have my body wash, and after a long day. I have no problem scooting around the house in flip flops, so I have those as well from Havaianas. Relaxation time. Nivea Touch of Frangipani features the Hawaiian Frangipani scent and sunflower oil pearls to leave your skin soft, refreshed, moisturized, just overall beautiful. I noticed softer, happier skin after using this body wash. The scent is very soft and gentle, it’s not overpowering and it did not irritate my sinuses. It makes a luxurious lather, rinses clean and leave my skin fragrant and fresh. There are only two entry methods- Comment and tell me what you do to escape life’s everyday stress, and/or subscribe to my weekly email newsletter. Ready, Set, Go! Shopping Sometimes Helps, but if not then Taking a Long Bubble Bath with Candles Also Helps. I escape with a nice hot bubble bath or some chocolate! i’ll get a massage once in a blue moon. I play lots of tennis! I get a kiss from my daughter. I have a cup of coffee and read. I take a hot bath and read a romance novel. I play outside in the fresh air with my dogs and enjoy being together. They make me laugh every time! I sit on the patio, under the trees with a glass of sweet tea! To relax and escape I like to take walks, read, watch a good movie, go shopping, take a bath or go on a date with my husband! I always escape from the stress of my day by taking a long walk in the park or taking my bike for a ride. I also like to listen to music while I do a facial mask whenever I am stressed out. I destress with exercise, a bath and then old movies. I like to go in my bedroom, close the door, and watch a movie with my headphones on. i go for a run or plan some fun stuff with a few friends. I go for a Pedicure! Get myself pampered and forget about the daily grind. Take a hot steamy bath! I have a 3 year old, so I tune the television to Peppa Pig and get a half hour to myself on facebook. I take walks to escape.